Stainless steel. 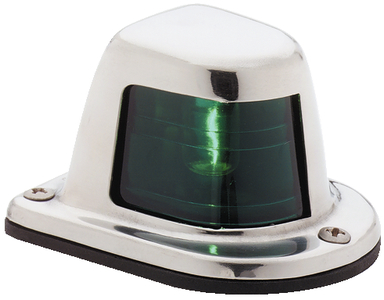 Provide 1-mile visibility for boats up to 39.4' in length. Includes 8 watt lamp. Installs with (3) #6 fasteners (not included). 112.5 degree visibility. Size: 2-1/2"L x 2-1/4"W x 1-1/2"H.